The dramatic art form of opera is a reflection and commentary on the human condition and our shared experiences of emotions. Joy, love, death, loss, illness, and betrayal are universal. These intense emotions transcend social, economic, and national boundaries to touch everyone’s life. Opera is an acoustic, visceral art form in which the human voice coupled with music expresses what mere words cannot. It can touch hearts, change minds, enlighten and bring people together across boundaries by expressing the commonality of shared human experience. The College of Charleston Opera program in the Department of Music trains the next generation of opera artists, and it is proud to produce three productions a year. 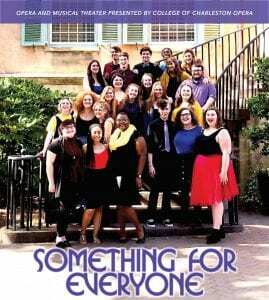 Charleston’s opera enthusiasts are encouraged to celebrate the opening of the 2018-2019 season with “Something for Everyone,” an evening of opera scenes and musical favorites directed by accomplished lyric soprano Saundra DeAthos-Meers, who joined the College’s music faculty earlier this year as Assistant Professor of Voice/Opera, and Amanda Castellone who is the Assistant Director of the Opera Program. The event’s program is a dynamic one, featuring students of all years and music by Sondheim, Mozart, Humperdinck, Puccini and others. The performance is one night only — Friday, Oct. 26, 2018 at 7:30 p.m. at the Recital Hall in the Simons Center for the Arts, 54 Saint Philip St. Tickets are available online or cash/check at the door: $15 general; $10 for College of Charleston students. For more information call (843) 953-5927.